If you guys follow me on Instagram you probably have seen my unboxing a huge pink box sent by KOSÉ Malaysia last week. I was blown away on how cute or should I say kawaii the box is with all the balloons and stuff. I must say that is by far the best PR mail that I've got in my entire life! Wuhoo. Kudos to KOSÉ Malaysia team! A+ for the effort and packaging! 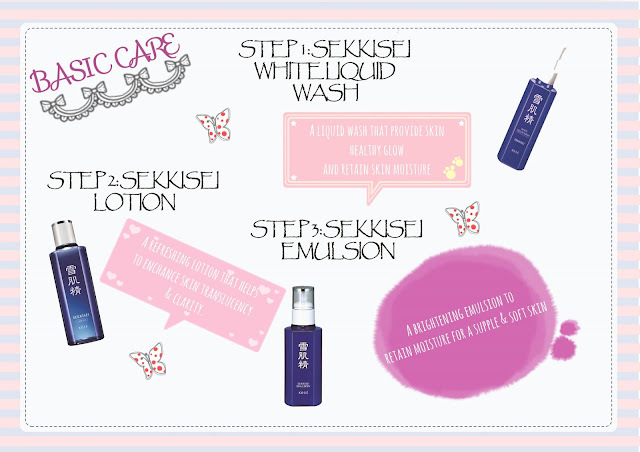 There are actually two different trial sets sent to blogger which are the Chic City Setsuko and Kimono Setsuko. Apparently, I received the Kimono Setsuko set. Let me explain briefly about the meaning. Kimono Setsuko is a kawaii cartoon icon for KOSÉ that represent a fun-loving , bubbly personality, well loved by SEKKISEI fans. The meaning of Setsuko is 'little snow' in Japanese which is a perfect match with the KOSÉ's commitment of bringing snow-white skin to women all around the world. 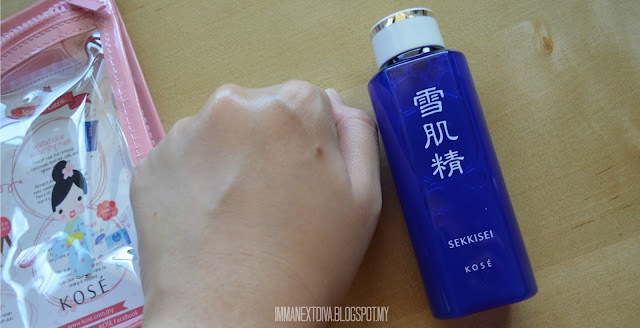 For over 30 years, KOSÉ SEKKISEI has been restoring translucence to women’s skin. Created based on an age-old ‘beautiful translucent skin recipe’, SEKKISEI’s well known for it's gentle yet effective brightening products. SEKKISEI products are made from the best Oriental Herb extracts, which are carefully-selected from about 100 different plants, creating a harmonious and skin-loving formula that gives women brighter, even-toned and moisturised skin. A trio of oriental plant extracts: Coix Seed, Melothria (White Lotus) and Angelica work diligently to keep your skin in perfect condition, protected from the harsh environment. 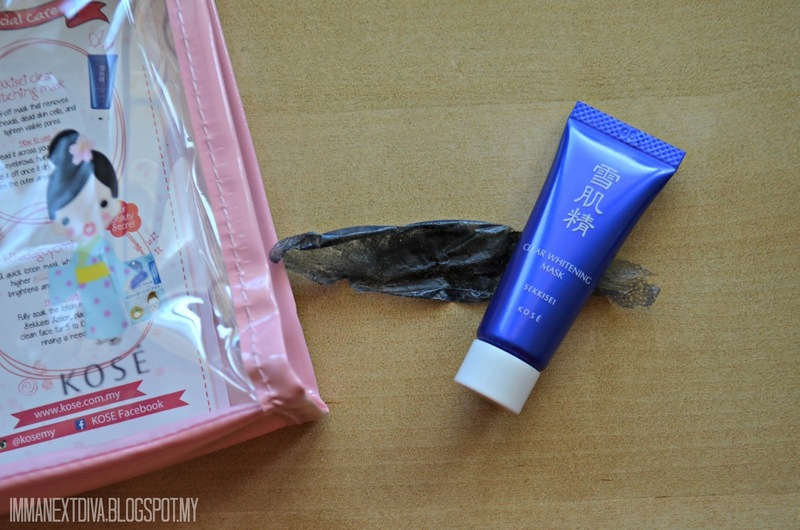 So, here is my review on the products that I received in my trial kit. Sekkisei's White Liquid Wash is a gentle cleanser that cleanse your skin but never take away the natural moisture from your skin. The Taurine-based cleansing agent helps to clean your but remain hydrated. Whilst, the Rubus Suavissmus Extract boosts the skin dullness and soothes UV damage. The liquid wash has light-weight consistency and lathered nicely on my skin to gently clean pores. I also love how it has subtle and botanical smell that helps me relax and soothes my skin all day. This is KOSÉ best seller that contains ingredients that are carefully-selected out of 100 different types of oriental plants to help balance out skin moisturizing level, prevent skin from dullness, soothes redness and more. This product is so unique that can be used as a toner or a mask. I will share the tips or how to at the end of this post along with a pictorial. Sekkisei Emulsion contains ingredients like Inula Britanica Flower, Chinese Pearl Barley, Paeonia Albiflora Root, Melothria Heterophylla and Angelica reveal more translucent and radiant complexion. It has a quick absorbing properties work deep into the skin to prevent freckles, dryness and dark spots. Recommended to apply 1 to 2 pump on a cotton pad and apply on the skin. The light-weight consistency and running texture make it easy to apply on the skin and i don't have to wait for too long to continue the next step of my skincare routine. This peel off my is definitely my favorite. It is so gentle and remove blackheads without hurting your skin. It is also remove dryness, dead skin cells, brightens and and hydrates at the same time. The secret ingredient in this whitening mask is the Chinese Quince Extracts to prevent the sebum production whilst the blend of oriental plant extract provide an intense whitening benefits. Below are the pictorials on what you can used using this trial set. There is a basic care which is recommended to use as your everyday skincare routine as well as special care that is recommended to use once or two (2) times a week. 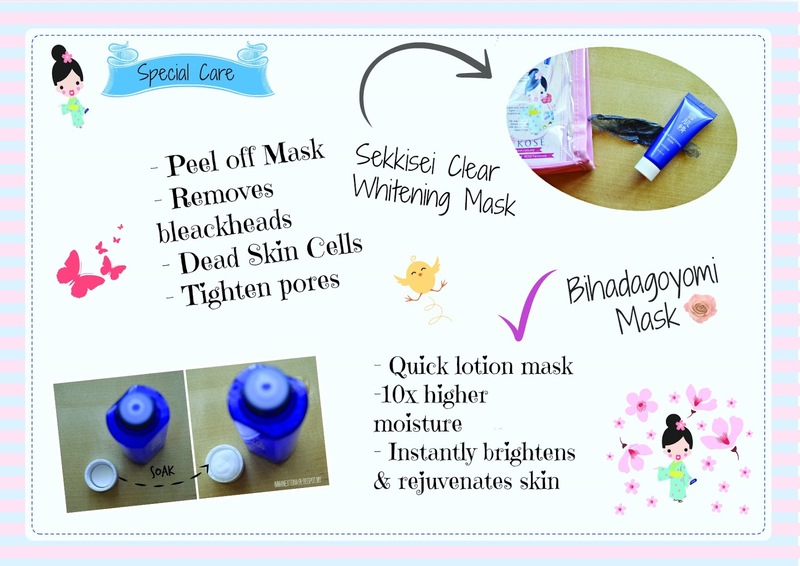 For Special Care, you can start off by using the Sekkisei Clear Whitening mask to remove all of the dead skin, blackheads and the dullness on your face. 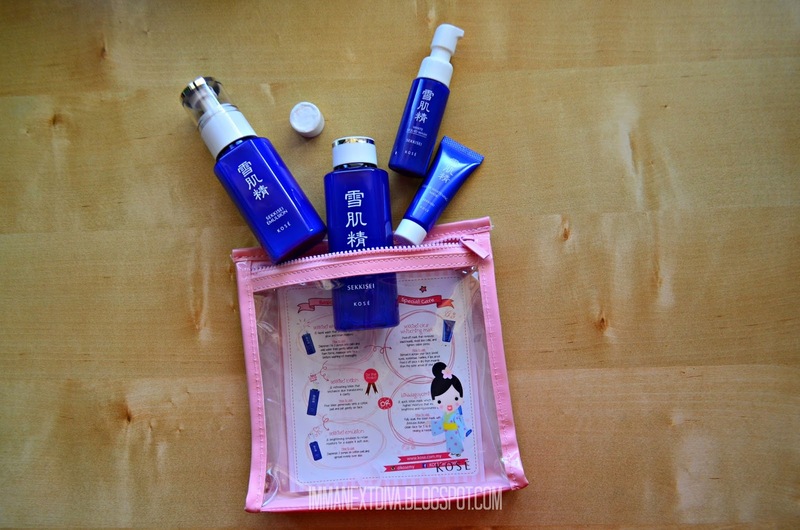 In this trial kit also, I received 3 bihadagoyomi masks. KOSÉ’s tip: For instant hydration, place a bihadagoyomi mask into the cap and pour SEKKISEI Lotion until the mask tablet puffs up (as shown in the second pic above). 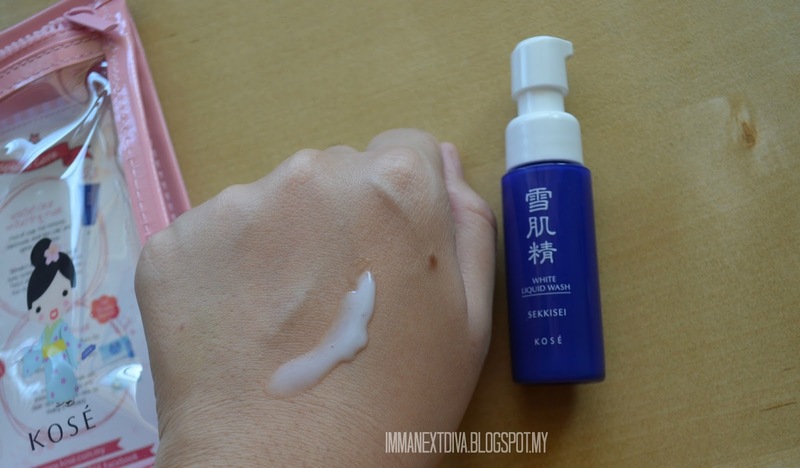 Place on face for 10 minutes (in my case I wear it until it dries out) and walla you instantly have hydrated skin already! I hope you enjoy reading my review and for more information you can visit links below.